The markets on Tuesday snapped six-day losing streak amid volatile trades, led by oil and IT shares. While the upswing was curtailed due to selling pressure from bank, capital goods and consumer durables stock. Mumbai: The markets on Tuesday snapped six-day losing streak amid volatile trades, led by oil and IT shares. While the upswing was curtailed due to selling pressure from bank, capital goods and consumer durables stock. Analysts say that Bihar polls impact the markets on the downside, while the good corporate numbers encouraged trade for Tuesday's trade closing on positive bias. On long-term trade, the markets consider US Fed rate hike proposal and government's reform push. 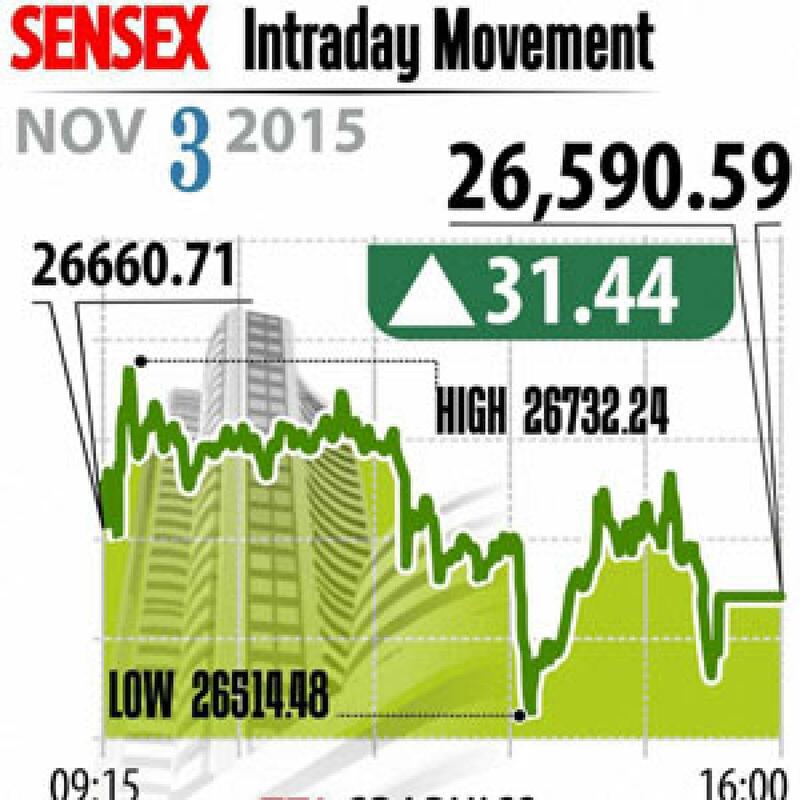 Sensex closed gaining 31 points at 26,590, Nifty ended up 9 points at 8,060. While broader markets outperformed with midcap and smallcap indices up 0.3 to 0.4 per cent. On the sectoral front, the sectors IT, metal and power indices reported gains up 1 per cent each, while capital goods and consumer durables closed in negative zone. The index heavyweights NTPC, ONGC, M&M, Hindalco and Vedanta gained, while Lupin, Tata Motors, L&T, Airtel and Tata Steel reported loses up to 2 per cent each. From sprit stock pack, Tilaknagar Industries, Empee Distilleries, Pioneer Distilleries rallied up to 16 per cent, while United Spirits, Radico Khaitan and GM Breweries up over 4 per cent each. The gainers: NTPC, up 2.15 per cent at Rs 135.65; Mahindra and Mahindra (M&M), up 1.96 per cent at Rs 1,232.80; ONGC, up 1.64 per cent at Rs 251.25; Hindalco Industries, up 1.61 per cent at Rs 82.25 and Vedanta, up 1.44 per cent at Rs 98.30. The losers: Lupin, down 1.38 per cent at Rs 1,873.50; Tata Motors, down 1.33 per cent at Rs 382.05; Larsen and Toubro (L&T), down 1.17 per cent at Rs 1,372.20; Tata Steel, down 1.09 per cent at Rs 236.05 and Bharti Airtel, down 1.01 per cent at Rs 346.85.